It Is A Moment You Can't Miss... seeing your new little angel live and in color! Watch your baby playing, sleeping moving…oh it's so amazing!!! 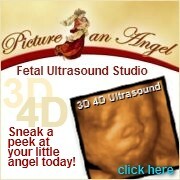 Susan Pazak, PhD, a clinical psychologist, is the creator of Picture An Angel, a unique fetal ultrasound studio in Lake Forest, California. From her professional experience, Susan knows how important the bonding process is and provides a comfortable atmosphere for moms and dads-to-be to bond with their new baby. LAPregnancy knows you've heard of these places before but Picture An Angel is the most affordable place around offering packages for every budget! It's worth the drive if you live far to sneak a peak at your new little angel today! Call today 949/457-1063 to make an appointment or visit their website to learn more - even buy a gift certificate for the mom who has everything! This Belly Scoop has been sponsored by Picture An Angel, LAPregnancy's newest sponsor!